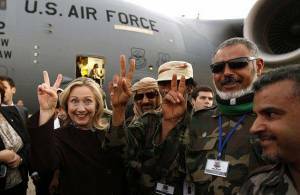 This recent photo showing U.S. Secretary of State Hillary Clinton posing with Libyan 'rebels' shows the pro-imperialist nature of the forces that have conquered Libya. The following report was written by ANSWER organizer Derek Ford, and was originally published on LiberationNews.org. After more than 9,000 bombing raids on Libya, NATO forces have overthrown the country’s sovereign government and brutally executed leader Muammar Gaddafi. Along the way, they have reduced much of the country, which had been booming with industry and agriculture, to rubble. Over these last seven months, however, despite the NATO attacks and terror campaigns by rebel forces, resistance fighters have struggled courageously, particularly in Sirte and Bani Walid, against the neo-colonial takeover of their country. This struggle is likely to continue even after the summary execution of Gaddafi, but what form it will take is still uncertain. The rebels first tried to capture the coastal city of Sirte on March 5, but were defeated in Bin Jawad, a town to the east. Having suffered serious casualties, on Oct. 7 rebels announced a “final” all-out assault on Sirte, although it was the fourth time such an assault had been announced. These assaults are composed of rocket, mortar and missile attacks as well as aerial bombings. Over the last two months, the NTC has prevented civilians in Sirte from accessing water, food, electricity and other basic human needs in an effort to weaken the resistance. Vital infrastructure, such as sewage treatment systems, have also been bombed, as well as hotels and apartment complexes. On Oct. 6, NATO warplanes bombed the medical center in Sirte. In Bani Walid, which is to the southwest of Tripoli, rebels have faced enormous difficulty subduing the Warfalla, Libya’s largest tribe, who were fiercely loyal to the sovereign government. During September, the rebels gave the Warfalla tribe numerous deadlines to surrender. When the rebels first tried to enter the town on Sept. 10, they were immediately repelled. The rebels retreated and called for NATO bombings. After nearly one month of continuous bombings, on Oct. 9 the NTC took control of the Bani Walid airport. On Oct. 17, they claimed to have entered into the town. It has been almost impossible for outside observers to know exactly what the situation was like in Libya. Not only the mainstream media, but also the non-corporate liberal media such as Democracy Now! have repeatedly reported false information. One of the earliest instances was when the rebels “confirmed” the capture of Saif Al-Islam Gaddafi on Aug. 21. After the false reports, he boldly showed up to the Tripoli hotel where press conferences are usually held and talked to reporters and supporters. Then, on Sept. 25, media outlets began running stories about a mass grave being uncovered in Abu Salim, supposedly containing the remains of 2,000 victims from a 1995 prison massacre. While nearly every media outlet ran with the initial story, very few reported later that the remains actually turned out to be camel bones. On Sept. 29, it was reported widely that Moussa Ibrahim, Minister of Information for the Gaddafi government, had been captured. But on Oct. 1 the NTC admitted that he was not in captivity. The NTC is still struggling to establish military and political authority in Libya, including in Tripoli. On Oct. 14, pro-Gaddafi protests were held in Tripoli. NATO-backed rebels armed with machine guns surrounded the protesters, who were carrying the green flag of sovereign Libya, and a major gun battle erupted. At a press conference on Oct. 10, Col. Roland Lavoie, a NATO spokesperson, expressed surprise at the level of resistance encountered by pro-NTC forces. Despite political, military and economic support from the world’s imperialist powers, including over 9,500 bombing missions, the rebels have faced a continuous intense battle to establish authority over Libya. Although Obama stated in March that regime change “is not something we can afford to repeat in Libya,” that was the goal from the very beginning. And now that NATO’s forces have killed Gaddafi, it has announced that it will end its bombing campaign against Libya. Gaddafi’s brutal execution and the capture of Sirte and Bani Walid no doubt mark a historic setback for the Libyan people. What remains to be seen is how these events will impact the struggle for Libyan sovereignty.